The final two books I have read during my most recent binge that will remain forever half-reviewed are Alice LaPlante’s Turn of Mind and S.J. Watson’s Before I Go To Sleep. The reason for not reviewing these properly is a little different from the books I mentioned yesterday. Both tackle an almost impossible premise and, for me anyway, one succeeds brilliantly but its subject matter is a little too close to home for me to discuss in-depth with any objectivity. The other didn’t work for me at all. Neither are really what I’d consider crime novels. 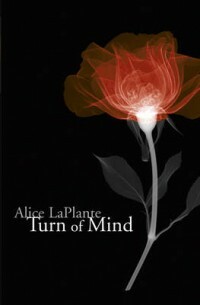 Turn of Mind by Alice LaPlante tells the story of Dr Jennifer White, an orthopaedic surgeon who lives in Chicago and who, at 65, has been diagnosed with dementia. Among the tribulations she faces is that her friend and neighbour has been murdered and there is enough about the crime scene to have Police suspecting Jennifer, though due to her condition they take things slowly. The book is told from Jennifer’s point of view, essentially as a journal of her life and her struggle to maintain some semblance of control over her situation. In the beginning this is relatively easy via the use of various memory aids and tricks but as the book (and the disease) progresses it becomes more difficult. I am not generally a fan of the first person narrative and in this instance it ought to have been unreadable but LaPlante pulls it off by being unsentimental and depicting Jennifer as a not entirely sympathetic but wholly credible character. As a surgeon, as a busy and not entirely willing mother and as a sufferer of Alzheimer’s Disease Jennifer feels completely authentic to me which makes her story well worth reading. It is, I have to admit, quite harrowing especially if you’ve had any personal experience with sufferers of the disease but on balance I am very glad to have read it. I think it probably gives genuine insight into what it must feel like from the sufferer’s point of view and while it’s not pretty if it is realistic it can only help people who have to watch loved ones go through it. I thank Maxine for sending her copy of the book across the sea to me and am quite glad I don’t have to return it in its tear-stained state. I normally try to take much better care of my books! S.J. 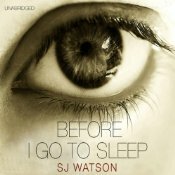 Watson’s Before I Go To Sleep is nothing like that book. I know it’s poor form to compare two random books that have nothing to do with each other (other than some similarities in premise and structure) but the coincidence of my reading them in the same short time span meant I couldn’t help but compare them. Again from the first person perspective this book tells the story of Christine something or other (I can’t remember and can’t be bothered to look it up) who through some ‘event’ (details are murky) has acquired long term amnesia and has lost her ability to create new memories that last longer than a day. So every day she wakes up thinking she is in her early 20’s (or sometimes a child) and every day she has to learn that she is a 47 year old woman who’s married to a teacher called Ben and has been in her current state of limbo for around 20 years. Christine has started seeing a new doctor who came up with the startlingly brilliant idea of her keeping a journal which they decide to keep secret from hubby (for a pretty pathetic reason but one necessary to the success of the plot). The good Doctor gives her a mobile phone that only he will ring her on so that he can ring her each morning and tell her where the journal is hidden and she can start to read about things in her life from someone’s perspective other than her husband’s. It is perhaps a sign of how bored I was by this book that I kept wondering about the little things like how did the phone get charged given it never left her handbag for fear of Ben finding it. As in Turn of Mind the drama here is meant, I think, to come from reading about this woman’s fairly horrendous life. Unlike in Turn of Mind though at no point did the author make me care about Christine or even believe in her reality. I simply never bought into the symptoms of the condition (though I have no reason to doubt that Watson says he saw a news article featuring a woman with these exact symptoms) or Christine as a sufferer of them or even Christine as a woman (I actually thought this book was written by a woman until about a quarter of the way through reading it when I thought ‘no woman would depict a woman in that way’ and I did enough googling to learn Watson is a bloke). It had almost none of the elements of good story that I look for; blessed instead with no conflict, no story arc, a weak and insipid protagonist and precious little suspense (I am genuinely astonished to discover there were readers who couldn’t predict the ending of this one). I wrote a few days ago at my wariness of reading much hyped, award winning books. They rarely, in my experience, live up to expectations. In that case, with Tom Franklin’s Crooked Letter, Crooked Letter I was pleasantly surprised and richly rewarded for having read the book despite all the hype. With Watson’s book (which took out the best debut category in the same awards) I got what is, for me, a far more common experience: me shaking my head and muttering under my breath about having read a completely different book. Whereas Turn of Mind had layers of substance that warrant re-reading, Before I Go To Sleep was, for me anyway, all surface and entirely forgettable. Its central gimmick might have sustained a short story but did not engage me for 12+ hours of listening. This entry was posted in Alice LaPlante, mini review, S J Watson. Bookmark the permalink. I haven’t read the S J Watson book, I looked at it some time ago before it won this award but decided not to read it (ie take it home from the library as it was there I saw the book). The reviews of it I’ve read on Amazon and elsewhere are very mixed. I have read the other two books you mention here – I do so agree with you about Turn of Mind, it is a very talented debut novel and though I did not think much of the crime plot I did like the characterisation and story of Jennifer – largely because of the manner in which the author told it, from different stages of her illness but not in a linear fashion. I can imagine it must be a very difficult book to read if you have any direct experience of the condition. Although your review here is brief, I think you’ve very well depicted the main appeal of the book. I agree with you also about CLCL, a magnificent book (and also not a crime novel). It is hard to know what to do about these “hyped” books, especially these days when there are people doing the hyping on the internet (eg Amazon et al,or bloggers commissioned to write by the publisher) who are not exactly independent. One of these was the debut by Elizabeth Haynes, Into the Darkest Corner, which has the most amazing number of 5 star reviews on Amazon. Even so I would not have read it but I was on holiday and had run out of books, it was only 99 p as a e-book so I gave it a try and I’m glad I did. It isn’t in the class of Turn of Mind or CLCL, but it is a neat little suspense thriller. However, Constance Briscoe’s The Accused, reviewed this week at Euro Crime, has also been hyped but based on the Amazon reviews, and the fact that she’s apparently written a couple of “misery memoirs” first, I don’t think I’ll bother. To be honest I should have gone with my gut feeling and not bothered with the Watson either…if I’d known it was written by a bloke at the outset that would have tipped me over the edge of not bothering (I think you have to be an exceptional writer to pull of a first person narrative in a voice opposite to your own gender) but I somehow had it fixed in my head SJ was a woman. It’s hard to know what to do when you’re wary of a book as I do try to be as open minded as possible but then I’ve also got a pretty good idea of the kind of books I find engaging. Still it worked with CLCL and I enjoyed that more than enough to make up for BIGTS being utter pants. You’re right…all three of these books mentioned aren’t what I’d call crime novels at all – except in the vague sense that there has been a crime committed but the book is not about the crime or its solution. I get annoyed with genre labels as I suspect these great books will be bypassed by a lot of literary types who would do well to read them. Bernadette – You know, I haven’t read Before I Go to Sleep. I read several reviews of it, thought I’d try it (because the premise does seem interesting), and just haven’t read it. I’m not sure now that I will. ..
As to Turn of Mind, I agree 100% that the crime doesn’t take centre stage in that novel, although it’s there, woven through the background of the story. It is a brilliant, harrowing, troubling novel, and difficult to read. But I, too, am very very glad I did. You’ve done an exceptional job of describing the character of Jennifer White, so I won’t re-hash it, but yes, she feels so genuine and authentic. Folks, it’s not an easy read but please, read this book. Oh dear, you haven´t exactly made it easier for me to make up my mind about Watson´s book. Well, with 120 other books to read first, I suppose I can just wait and see what I feel like when I´m 60 and need new reading material. I decided after reading a few reviews (good and not so good) of Before I Go to Sleep that it wasn’t for me and after reading your review I can see I was right. It’s difficult to decide when reading hyped up books just what they’ll be like for me – usually the hype alone is enough to put me off but I do look at them if I see them in the library or bookshop, just to make sure that I’m not missing out. I’m not sure I could read Turn of Mind, having had a relative who suffered in a similar way. This is a complicated set of reviews. I have been wondering about Watson’s book, but I was turned off when I found out the author is a man. I couldn’t figure out how a man could really get into the mind of a woman in this predicament, and kind of lost interest. Reading this review made my decision, although the book’s premise slightly intrigued me. But my own aggravation at a male writer mischaracterizing a woman character, what she thinks, says, does, would be too great. And I’m glad I’m forewarned. LaPlante’s book sounds very good, but I also have had to deal with a relative in this situation, and I dread to read about a character in the throes of dementia. Agreed that Crooked Letter, Crooked Letter is a superb book for many reasons, as has been stated here. I don’t read books because they’re hyped, but because I read good reviews by those who are good judges of books or because a friend recommends a book or hands one to me. Some very-hyped authors I avoid altogether, and today with lots of gratuitious violence and mounting body counts in crime fiction, it takes a bit of investigating and reading reviews to find books I want to read.